President Rodrigo Duterte will kill Michael Yang, his former economic adviser if the Davao-based Chinese businessman is involved in illegal drugs, Malacañang said on Tuesday. Presidential Spokesman Salvador Panelo made the statement after sacked Philippine National Police officer Eduardo Acierto claimed that the President and former PNP chief Ronald dela Rosa ignored an intelligence report about Yang’s alleged involvement in illegal drugs. “You don’t know this guy [Duterte]. He [Duterte] will kill him if he [Yang] is involved [in illegal drugs],” Panelo told reporters. • Malacañang said Tuesday Yang is no longer Duterte’s economic adviser. Executive Secretary Salvador Medialdea said in a text message that Yang’s “one peso per annum contract” expired on Dec. 31, 2018. • Acierto released his own matrix showing the alleged links of Yang and Chinese businessman Allan Lim to the narcotics trade. According to the matrix, Yang and Lim are both linked to the drug syndicate of Johnson Chua, a Chinese national, allegedly operating in the Philippines. • Philippine National Police Chief Oscar Albayalde on Tuesday denied receiving an intelligence report from Acierto that tying Yang and a certain Allan Lim to the illegal drugs trade in the country. • Malacañang said Tuesday Acierto, who linked Yang to the illegal drug trade, was just disgruntled and probably wanted to get back at Duterte and the government after he himself was tagged in the drug trade. Acierto on Monday slammed the government and accused Yang of involvement in the drug trade against which the President has been waging a relentless war. • Albayalde on Tuesday rejected the claim by Acierto that Yang and a certain “Allan Lim” had ties to the illegal drug trade. • Opposition senatorial bets have urged Ombudsman Samuel Martires to investigate President Rodrigo Duterte and other administration officials in light of the allegations of a former police official linking Yang to illegal drugs. Panelo said Duterte would not tolerate anyone involved in illegal drugs regardless of their relationship. But he remained unconvinced that Yang was into drugs, saying that Yang’s closeness to Chinese Ambassador Zhao Jianhua spoke for his reputation. “Also, common sense will tell us that he is not involved. According to the President, Ambassador Zhao slept in the house of Yang. And we all know that the Chinese government is against illegal drugs, and the Ambassador will never associate himself with anyone involved in drugs,” Panelo told reporters on Tuesday. In October last year, Duterte cleared Yang of alleged drug links, saying the Chinese envoy admitted sleeping at Yang’s residence in Makati. The President’s spokesman recalled Duterte’s narrative. “The fact alone that you are an ambassador of China, and your government is against the illegal drug industry, how can you be associating yourself with somebody you know to be involved in drugs? Obviously, he’s not involved,” Panelo said. On Sunday night, Acierto surfaced to claim that Yang was involved in the illegal drug trade. The sacked police officer also revealed 2017 documents detailing the supposed links of Yang and another Chinese national, Allan Lim, to illegal drugs. 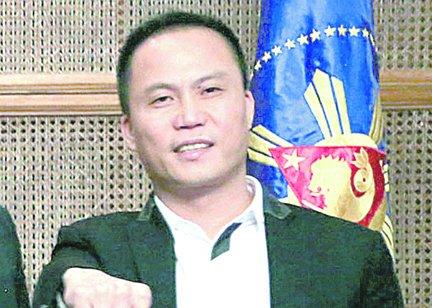 Acierto, an anti-narcotics operative, bared his group’s intelligence report on Yang might have provoked the President.